Happy 2012, everybody! For Christmas I just wanted a couple of weeks off to let passions cool on the great Robin’s Imaginary Kids: Bane or Blessing? debate, and that’s exactly what Santa brought me. “Tailgate” finds our ensemble in a more optimistic mood — taking the reins, starting new enterprises, reconnecting with family. The dovetailing of Marshall’s time with his deceased dad and Lily’s reunion with her absent one was satisfying, and the opening of Puzzles was a delight. 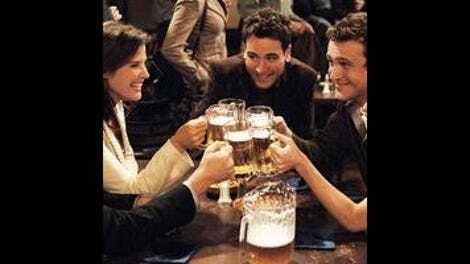 If we go by the principle that the first instance of any repeating phenomenon in the new year (sports contests, committee meetings, rubbers of bridge) sets the tone for the whole calendrical cycle, I think we’ve got a solid second half of the HIMYM season coming up. The framework is Marshall spending New Year’s Day at his father’s grave, watching the Vikings-Bears game, drinking beer, and grilling up some burgers, just like they used to do together in the stadium parking lot. As Marshall tells his dad the story of New Year’s Eve 2011, his brothers horn in, followed by a bunch of rubberneckers from a funeral across the way looking to check out the score and get a snack. “Aunt Flora sure loved a toasted bun,” hints a mourner using his loved one’s tradition of tailgating to play on Marshall’s sympathies. In the most poignant of the plotlines, Robin has to take over producing for her less morally scrupulous colleague Tina after she breaks up with Sandy Rivers on air during his nationally televised “2011: The Year In News” special. When he leaves to find Tina, she chases him, only to find the couple is back together and Sandy’s open to a three-way, which means Tina’s out again. It’s a dreadful end to a year that Robin is happy to put behind her, but it does give her a chance to get back on the air — which will be her start down the road to the nightly news coanchor position, we are told in a flashforward to the show’s opening graphics. And in the tenderest of the storylines, Marshall insists to Lily that he be allowed to read to their child from Enigmas of the Mystical, a Time-Life book about unexplained phenomena like a mother and daughter making almost identical sandwiches at the exact same time on opposite sides of the country (well, one was chicken and one was tuna, but still). It’s the Erickson-Aldrin version of the question about whether the kids will be raised in the church, and I smiled at the little wink to that old question in a nicely Marshall-centric guise. Marshall wants to raise his son in a world full of mysteries: “If there aren’t yeti and leprechauns, what’s the point of getting up in the morning?” But Lily had a more hard-nosed childhood, with a dad who never gave her anything to believe in and forced her to rely on herself alone. As the evening winds down, Puzzles deteriorates rapidly; disorderly patrons force Ted and Barney to raise drink prices and hire the bouncer from downstairs, who brings his damp party hats. And Lily feels disillusioned after Marshall urges her to call her dad, who’s hawking his board games at a convention, to tell him she’s pregnant, only to get the brushoff. But Marshall realizes that the way everyone is congregating around his tailgate is the same way they used to be drawn to his dad, who had a burger and a beer for anyone who stopped by. When Lily’s dad shows up on their doorstep, it’s a true enigma of the mystical — nothing she could expect, but maybe something to believe in. If I had to read a portent into Kevin, Ted and Barney toasting Robin’s televised New Year’s Eve countdown, it would be that the Kevin situation will not be resolved quickly or easily. And isn’t it interesting that Barney and Ted are throwing their fortunes together — the two of them single and unimpaired, taking a few last runs at the youthful, foolish “let’s put on a show!” aesthetic. We’re going to see Robin come between them yet, as Victoria predicted at the season’s outset. And when she does, I think the kinds of maturing realizations that Robin, Lily, and Marshall have all undergone lately will be forced on the last two Peter Pans in the dramatis personae. The board games Lily’s dad is promoting at the convention: Shoplifter (which does not promote crime — it celebrates it! ), Tijuana Slumlord, Slap Bet (Fun! Laughs! Hitting! ), There’s a Clown Demon Under The Bed!, and of course, Diseases! Most of the enigmas of the mysterious from Marshall’s book could alternately be explained by the drinking, mental problems, divorce stress, and history of attention-seeking behavior of those reporting the strange occurences. Ted and Barney are ready with a banner for their bar, featuring the name in the Cheers font and a domain name they secured with great foresight (www.puzzlesthebar.com, which at the time of this posting was still showing placeholder text when it wasn’t returning a 403 error) (update: site's now up, with a menu of random snacks from Ted's pantry, a secret message from Kevin (scroll to the bottom of the menu page and highlight the text), and a calendar of debauchery and literary events). This seems like a good opportunity to remind you that a bunch of us are revisiting Cheers season 1 every Thursday. You wanna go where everybody knows your name, and that's the place. Marshall as a kid wonders whether there’s anything his dad doesn’t know. “No, I know most stuff,” is his dad’s utterly charming answer.